At Wave, we value the relationships God has given us, whether they be with our spouse, our children, friends, or family. One thing we know, though, is that since relationships are comprised of people, fluctuation and change are inevitable. Personalities that compliment and normally get along will sometimes clash, causing irritation or hurt feelings. Do you need some tools to help overcome conflicts, learn how to turn destructive coping behaviors into positive interactions, or embrace your spouse's personality differences? 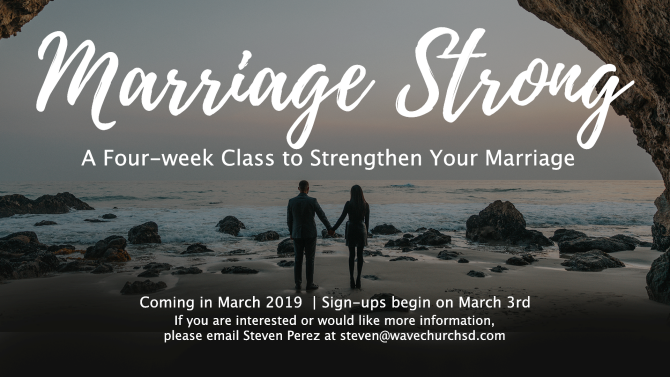 In this four-week marriage class, we will empower you with tools to encourage one another in your spiritual and emotional growth, examine how your past affects your relationships, and how to improve your communication. Wednesdays, starting March 27th, from 7 to 9 p.m. for four weeks.